Sources for early music in Korea can be found elsewhere.4 As for references to the "geum" (qin) in Korea, these are quite common as literary or artistic motifs.5 Apparently it was also, at least at times, included in some court or ritual orchestras. 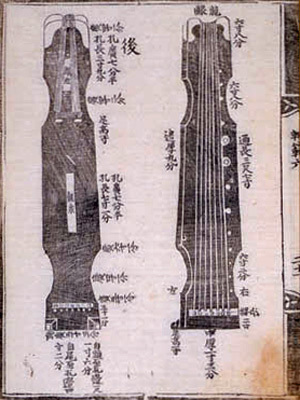 Nevertheless, the instrument itself was rather rare, qin players themselves even rarer,6 and qin handbooks virtually non-existent.7 In addition, in Korea the character for "qin" has also been applied to a number of other stringed instruments, as was the case in China as well as elsewhere in Asia. As a result, when one sees mention of a qin in Korean writing, it is not always clear what instrument the writer had in mind. 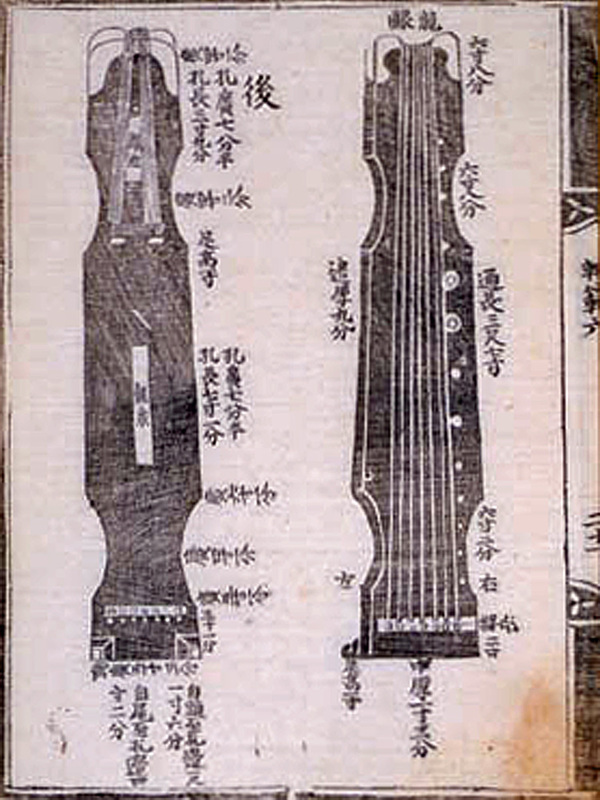 Although the qin may have been included in Korean court or ritual orchestras, and these were largely patterned after such ensembles in China, to my knowledge there are no reliable written records that could tell us what specifically the qin played; there also seems to be no record that the music thus played was ever played solo, as was described above with the komungo. Playing such music in a recognizably Chinese style would presumably be quite problematic, as traditional Korean music largely uses triple rhythms, even inserting this into music said to be from China in spite of the scant historical evidence for such rhythms in China (concerning which there is further comment with the modern version of Jiu Kuang). Officially Korean traditional music is divided into two categories that might be translated as "classical" and "folk".19 Court music, which falls within "classical", is then divided into three types: A-ak (雅樂; Chinese ritual music); Hyang-ak (鄕樂 Korean music); and Dangak (唐樂; said have originated in Tang dynasty China but to have been adapted in Korea). There are many recordings of this music available today, together with much commentary. However, most is in Korean, making it difficult to assess how accurate are the claims for antiquity of the modern interpretations of this music. 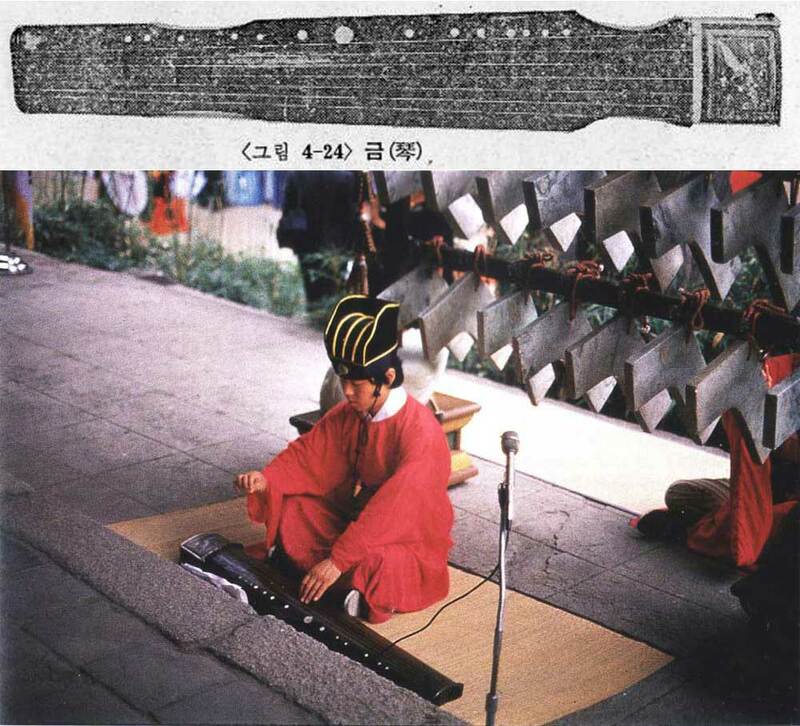 A major source for music in Korea before the modern period is a 15th century compendium called the Akhak Gwebeom. From its contents we know that the qin was officially part of court ensembles at least as far back as the beginning of the Joseon Dynasty (1392-1897). Some of the music played by such ensembles, of various types, is said to date back to the Tang dynasty, though it is more common to think that this music might shed light on court music as played in China during the Song or Ming dynasties. In particular, the Song dynasty court in 1118 sent to the Goryeo court (918–1392) in Korea a major gift of musical instruments; all the instruments were apparently destroyed by the fall of Goryo, with any accompanying music also apparently lost, but it is then said to have been "revived" after 1430 - by looking at written sources, not observing performances. As for the actual commentary in Akhak Gwebeom on the qin, there seems to be little or nothing that is specific to Korea. Other than this, the most appropriate qin melodies would seem to be those associated with relevant Korean paintings, as outlined above. As played in a Korean ritual orchestra? The Korean pronunciation/Romanization of qin is geum. In Korean 琴 (금 in hangeul) has been Romanized several ways. This site mostly uses the revised standard system, in which qin is written geum; McCune-Reischauer is kŭm; Yale is kum. It may also be called other names, including gogeum (古琴), chilhyeon-geum (七絃琴) and hwigeum (徽琴). An early source for information about the geum in Korea is the Akhak Gwebeom. The qins shown above and at right seem to raise more questions than they answer. The qin as illustrated in the image above comes from the original text (軌範六 二十一) of the Akhak Gwebeom (below). It seems unlikely that it was an actual instrument as the hui are incorrectly placed (they are not in the correct positions to indicate harmonics, and they extend too close to the bridge to indicate actual stopped finger positions). The Musical Canon (or Standards of Musical Science: Akhak Gwebeom or Akhak Kwebŏm, 1493) is an early 朝鮮 Joseon Dynasty Korean text on music; the edition considered here was published in Seoul, 1976, in two-volumes with modern commentary. It is the major source for early Korean music. Further details on/from Korean sources are needed. Walter Kaufmann, Musical Notations of the Orient; several sections concern notation systems used in Korea. Unfortunately, there seem to be quite a few errors, making much of what he writes unreliable (further below). The qin (also called guqin) is the classical Chinese seven-string zither, and has a long and profound history in its native country. Created, according to one traditional origin story, early in the third millennium B.C.E., it is perhaps the central musical instrument of China, found first in the hands of sage kings and philosophers, and later in those of literati artists. As a common subject in literati painting, the qin has a rich tradition of iconography within China. The qin’s primary history is, of course, that of its use in China, yet the instrument was historically introduced to surrounding countries in East Asia, principally Japan and Korea. Due to the difficulty of the qin’s playing technique as well as its involved relationship to Chinese culture, the use of the instrument remained largely marginal in these countries. However, in Korea and, especially, Japan, the qin played an important role among those who emulated the literati arts of China. We therefore find images of qin and qin-players figuring into Japanese and Korean two-dimensional art in a variety of genres. As actual qin were rare in these countries, representations of the instrument often had a hybrid appearance, combining features of the qin with those of native zithers such as the koto (in Japan) and the komun’go (in Korea). In the present paper such visual representations (or, indeed, misrepresentations), and their sources, are examined for what they reveal about how the qin was perceived in these countries. Also explored will be the related topic of how Japanese and Korean literati artists musically viewed and interpreted the Chinese music for the qin, as well as how they created their own genres of qin music: new genres which were themselves blendings of Chinese and native materials. Kaufmann's Musical Notations of the Orient has several sections on music notation in Korea. Very little seems to concern qin, but his use of "zither" in some cases seems to reflect the fact that Korean references are not always clear on what is meant by the character 琴, be it geum from China, or the geomungo, gayageum and so forth as developed locally. This might also help explain a number of errors in Kaufmann's account. "It is probable that manuscripts such as the Youlanpu, with detailed playing instructions, were favored by Korean musicians because they enabled them to learn zither playing without any detours to study notational symbols...." (p.305) Since You Lan was written in wenzipu, this assumes the Koreans could read Chinese, in which case the simplified tablature would still have been much simpler to read. A further comment on p. 305 says that a handbook called Songbook for the Huiqin (徽琴歌譜 Hwigeum Gapo) was preserved in Korea until World War II, when it was lost; I have not been able to follow the relevant references. This image (taken from Wikipedia) is from an original painting by Sin Yunbok (ca. 1758 - after 1813) now in the Seoul Gansong Museum (aka Gansong Art Gallery). The instrument being played is a komungo, said to have been the Korean equivalent of the Chinese qin. However, although Chinese literary sources such as novels show that the qin was indeed played in such mixed company, Chinese literati painting rarely depicts such events; more typical were elegant gatherings. Clark has some discussion of this; further examples pending. 6. Clark's article mentions that the earliest reference of a Korean qin player dates from 1542, and that there were Koreans going to China to study qin in the 19th century. Today there are good Korean qin players, but to my knowledge no indigenous characteristics are developing. Although the qin was in theory included in the Korean court ritual orchestra, there is no information to suggest that there was anything distinctive about what the qin played, so any notation of the court music would be an unlikely source for such music. Clark's article mentions that copies of the Shilin Guangji, which had a few modal preludes, were brought to Korea. There is no evidence that the modal preludes were ever played in Korea, but the philosophical attitudes that the Chinese book applied to the qin did in Korea get applied to music for other instruments. The referenced Wikipedia article4 uses the official Korean romanization "geomungo" rather than the much more common "komungo". The association with black cranes, mentioned above, is reminiscent of Chinese stories such as those of Shi Kuang and Chu Shang Liang. The qin is said to have been brought around 550 CE from 晉 Jin, a Chinese dynasty centered in Nanjing that had ended around 430 CE. Kaufmann, p.302, says that the story of 王山岳 Wang San-ak inventing the komungo around 550 CE comes from "the oldest Korean historical document", the 12th century 三國史記 Samguk Sagi by 富軾 by Kim Bu-sik. Archeological findings have suggested that zithers of this type existed in Korea for several centuries prior to the sixth century. In 1978 the commentary by Tong Kin-Woon for the catalogue to an exhibition of Korean musical instruments that year in Hong Kong stated that zithers of this type could also be found in China from that time; when the Korean ministry read this they said they would cancel the exhibition unless the catalogue was changed. This term described Korean scholar-officials (and their families) as including "both classes", the literary class (munban 文班), and the martial class (muban 武班). See the Wikipedia article for details. Korea has three main zithers. 牙箏 Ajaeng played with a bow (compare the Chinese 軋箏 yazheng). Within the above there are a variety of styles, both ancient and modern. And all are useed to play the traditional music style known as sanjo (Wiki). The examples linked do not show the instrument very clearly (further examples pending). The painting above is not representative of this style, as mentioned above. It is interesting to compare the thought processes involved in this "translation" of qin into local imagery with the decision of R. H. van Gulik to translate qin into English as lute. Examples pending; the painting above is not in this category because in literati painting one would not normally find a qin played in such an environment. 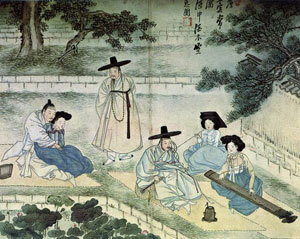 Clark's article discusses two such examples, a painting of immortals by 金弘道 Kim Hong-Do (1745 - ca. 1806) in the Seoul National University Museum; and one from an album of landscapes by 李慶胤 Yi Kyong-Yun (1545 - 1611) in the Korea University Museum. In both cases the instrument depicted seems to be a hybrid. Some of the relevant paintings were found through net searches that found such websites as Cultural Assets of Korea. These were then mostly linked rather than downloaded - unfortunate, as most subsequently were either removed or moved to another address. Since then it has proven difficult to find some of them again. Although the original painting title concerns the Peach Blossom Spring, it is identified on a Korean website as Huaxu Dream (see Huaxu Yin). The fact that I have not found records of this is, of course, not proof that they did not exist. Today Koreans officially categorize their traditional music as either 正樂 jeongak (chŏngak; variously translated as "correct music", "court music" or "classical music"), or as 俗樂 sog-ak ("folk music", but it includes such high art genres as pansori and sanjo). Presumably guqin music in Korea would all have to be categorized as jeongak. The above concerns a program such as I would do. There does seem to be a recent interest in Korea in exploring the history of and the potential for qin in Korea. For example, 琴聲還鳴 (금성환명 Geum Seong Han Myeong), a recent 3-CD set by Korean qin player 金商順 (김상순 Kim Sang Soon), includes modern qin compositions by Korean composers as well as music from ensembles that in the past might have included qin (I have not yet heard the CDs). Like all the other Korean qin players with whom I am familiar (although Ru Shan has returned to silk strings), she is trained in China following the modern styles (in her case, Li Xiangting and Wu Wenguang in particular). See also the commentary on the source of Sai Shang Hong. In theory, such texts could have led to people on occasion demonstrate the music on the qin, but to my knowledge there is no record of this having been done. Yun Yonggu, 古典徽琴譜 Kojŏn hwigŭmbo (1885). Contents: court pieces, 靈山會相 Yŏngsan hoesang. There exists an entire modern book devoted to this source. Yun Yonggu, Ch’ilhyŏn'gŭm po 七絃琴譜 (1885). Contents: Yŏngsan hoesang, court pieces (perhaps has the same contents as the previous, but a different copy). Regarding Yun, the following accompanies an image on the website of the Kang Collection. "Renowned for his excellent calligraphy, the government official Yun Yong Gu (ho: Seok-Chon) is even today a household name. Yun was also a celebrated painter of bamboo, orchids and landscapes. Disheartened by Japan's occupation of Korea, Yun Yong Gu left the public arena in which he was so well known and spent his last years as a recluse." It would be interesting to have more details about his personal experience with the guqin himself.